It has been a while for me here on Stack Overflow, and from the beginning of my experience I've noticed something which still leaves a bad taste in my mouth when I create and edit posts: in the current Markdown editor there's no support for the TAB key. This isn't only related to Stack Overflow (obviously), it concerns all the Stack Exchange sites, although Stack Overflow users are the ones who suffer the most for this because of the enormous amount of short or long code snippets which get posted and edited every day by everyone. It often happens that, when writing a code snippet, if I want to indent or dedent several lines of code I have to move the caret at the beginning of each line and manually add four spaces, and let's say it, this is just boring and time wasting. Despite the fact that I prefer tab (\t) characters, I understand that tabs may not always be rendered the same way, and it's better to use spaces for code snippets, but as of now, it's a real pain to always have to hit that spacebar thousand of times every day while writing posts. Why does tab key not work while writing questions/answers? General internet browser convention dictates that the tab key be used to cycle between various controls on the page, and not to represent the \t character, even when a text input control has focus. Now, I understand that the real behavior of the TAB key should be to cycle between page controls and input fields, but that's a feature worth a submission form (some page with a good amount of input fields), and not a page containing a single main <textarea>. Many programming sites already implement this by default, and we, as developers, generally expect the tab key to behave like this, being used to IDEs and text editors which support this feature by default. I personally hit the tab key several times a day while editing answers without thinking about it and always ending up being teleported at the bottom of the page, in the edit summary or tag field, having to scroll back to the top. Implementing tab characters (\t) is not a good idea, and that's ok. This although doesn't mean that we cannot implement four-spaces indentation with the TAB key. Dedent multiple lines of code by 4 spaces selecting them and pressing Shift+TAB. Now I think you probably understand why this would be really significant when talking about very long snippets of code with multiple nested indented blocks. I would like to give a boost to this post so that Stack programmers will notice it as soon as possible. Could we have this beautiful feature? We are developers - we basically expect Tab to indent code and Shift+Tab to unindent it. This could be implemented on programming-related sites only (SO, Programmers, Code Review, Programming Puzzles) if you think it'd confuse users on other sites - but it'll feel natural to programmers. I'd go as far as saying this feature should be on by default, and I don't see the point in being able to switch it off. The current behavior feels like editing code in notepad, while we could get something like, say, Notepad++ instead. Moreover, many people over here don't even know they can use Ctrl+K for basic indentation support, and the behavior of Ctrl+K (indent when not indented, unindent when indented) is confusing in the first place - mainly because it diverges from what we expect from Tab. Also, it doesn't allow to indent more than once so it's useless for reformatting parts of code. There's an excellent user script that adds tab support to answer text edit fields. I installed it with TamperMonkey for Chrome, and it works great! Check out Better Stack Exchange (Google Chrome Extension). 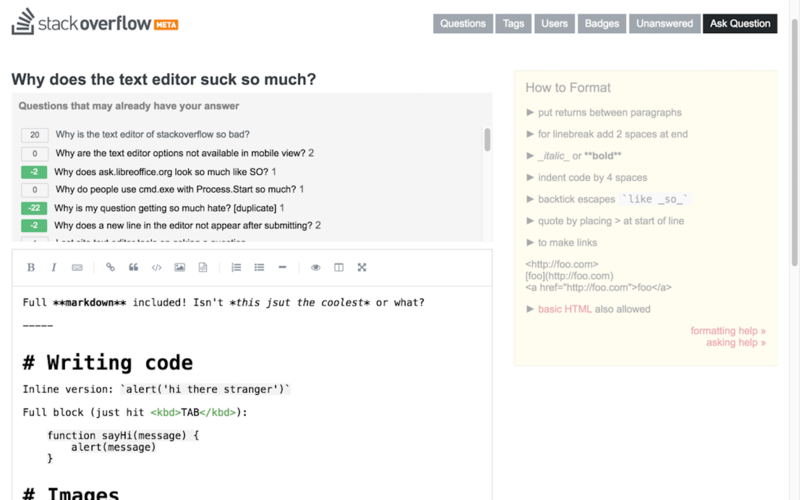 It swaps out the default text editor that Stack Exchange uses with a modified version of SimpleMDE. Shameless plug: I wrote this extension, and I'm using it to write this answer! I really have to disagree with this. As annoying as it can be, the default behavior is designed to allow for mouse-free movement between inputs on the page. Even though everyone has mice now, you still don't want to remove that ability and completely alter the user's experience like that. Every time I make a new answer or question that uses code, I just copy the 4 spaces and do a Ctrl-V anytime I would normally do a Tab. If the user wants to create a user script like David Harkness is suggesting, that's great. Each individual user who wants that functionality can do that. I'm also curious what the effects would be for screen readers and other visually impaired assisters if we remove the native "Tab" functionality from a single box. Not the answer you're looking for? Browse other questions tagged feature-request code-formatting editor . Why does the tab key not work while writing questions/answers? How to prevent key-tab from pulling out to the next input? How do I remove excess indentation on my code blocks? Is there a way to indent a chunk of code?